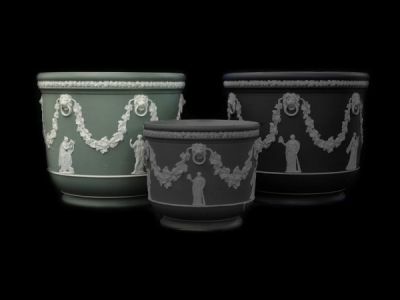 Wedgwood Jasperware cream colour on sage green jardinière. Applied classical “Muses” figures, lion ring ornaments with grapevine swags. Incised “Wedgwood England.” Sits 21 cm high. Sold as found; base has a hairline crack.